Hello, hello…thanks for visiting ilove2sweat! My husband, Mark, and I do DIY home renovations and restorations. We love finding old homes that other people think are sad (or gross!) and bringing them back to life! Yes, we’re posing…please don’t judge. We live in the very cool city of Pittsburgh, Pennsylvania where we finished our first renovation and have just started our second…it’s an old Victorian house that is going to be spectacular! I’m a TV reporter by day and Mark is a landscape architect. We basically use all of our free time (and money!) to renovate, remodel and totally revamp these houses. CONTACT: I’d love to hear from you…please send an email to courtbrennan@gmail.com. Find out how ilove2sweat got its name —> HERE!! renovating/remodeling/totally revamping home – it states you are creative and tend to be stay creative. great blog. Thanks much!! Appreciate you following along! You really have such a positive attitude and sweet disposition, considering that you are living in a Construction Project. My Dear wife complains when I get dirt and sawdust on the floor from installing a light fixture. 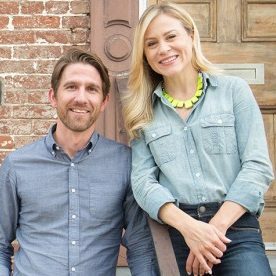 I am enjoying the continuing story of “Mark and Courtney Rebuild a Home”. Thanks for following along! Appreciate it! Happy to have found out about your blog. My husband and I will be demolishing and build a home on 38th St. We hope to get started in October. A great & very exciting project indeed. for you& Mark. I would think about how your plans for the high deck & it’s access to a bathroom, fridge & food preparation. My thoughts: Turn the 2nd floor brick addition into a sports “TV/REC ROOM/MAN CAVE” room with a fridge, a very small countertop for limited food prep & a few kitchen cabs. A large ULTRA TV & billiard table a must :). I take for granted there is a 2nd floor bathroom. IF possible their would be a flight of steps from the downstairs kitchen to REC room. I would remove the little shed addition & build a high deck off of REC room.You now can plan for deck size, handrail & IF you decide later to put some kind of roof on your deck latter you will have a manageable size. I like this idea because of the REC room, access to REC room & outside high deck to kitchen. I also think their would be less demolition & not a fan of losing inside livable sq. footage. BUT, I find REHAB fun IF you maintain a reasonable timetable that allows vacations, friendship & family time. Like I’ve advised before, key up the drywall man to hang & finish the drywall. Money well spent, minimizes dust & dirt,saves huge amount of time & looks great. Thanks Tim! I will pass along the game room/man cave idea to Mark…you might have got him thinking!! I reached out to you earlier in the year, in hopes to talk about the possibility of developing a show around you and your husband. Just wanted to reach out again to see if you are interested. Please feel free to email me at: jessica.mathies@papernyentertainment.com.